Figure 7: Turn with roll time of 2.5 seconds, allowing wings level for about 1 second, centered at the edge of the Naval Annex. The information from Stafford and Prather, indicating that the plane was flying with wings level over the Naval Annex, is contrary to the calculation made in the main paper, which shows the plane steeply banked to the right. It is obvious from these illustrations and remarks that the right turn, if it occurred, did not commence until the plane had passed the Annex. In order to have the wings level at that moment, the plane must have been halfway through its roll from a left to a right bank. There is another factor which must be considered. These witnesses indicate that the plane continued wings level for a short period after passing the Annex, while it descended. William Middleton supports these observations by saying “As it comes past me it was dropping” and showing a flat gesture with his right hand. He then shows with his arms that the plane banked slightly, both right and left, and says, “While descending, he was straightening”. His words and gestures contradict the concept of a steep bank angle. As explained above, the roll period must be increased to over 2 seconds. Some additional time should be allowed so that the plane can fly wings level for a short distance after it passes the Annex to accommodate these reports. A calculation based on a roll period of 2.5 seconds is shown below (Fig, 7). This is still likely to be too short, thus easing the stress of the left and right turns. The long yellow line is the track as determined by radar, extended by the FDR data, which shows a straight course. The maneuver is shown in red where the plane is fully banked, in orange where bank is changing, and in yellow where the plane can be regarded as flying wings level. The radius of turn is found to be 1,999 feet. The official speed is 530 miles per hour. This gives a bank angle of 83.9 degrees with a wing load of 9.45g. Clearly, survival with that wing load is absolutely impossible. The reader is invited to confirm the radius of turn using Google Earth. The method for calculating the bank angle and g-force from speed and radius is set out in the main paper. Let us now consider how this path fits in with the various witness statements. The plane would be flying level as it passes the Sheraton, just commencing its left bank. That is in accord with Deb Anlauf, who saw the plane clearly from the 14th floor of the hotel, but made no mention of bank. As the plane passed the workshop of Ed and Shinki Paik, it would be fully banked, but Ed only caught a glimpse of it as he dropped his head to peer upward through his shop window. The plane passed very close to the VDOT antenna tower, so may have damaged it, as the Paiks speculated, after noticing an aerial appeared to be bent and seeing some repairs being done the next day. The plane would be flying level again as it passed Terry Morin, who made no mention of bank. As the plane continued past the Annex it would be able to remain wings level for half a second as it descended, in accord with Stafford, Prather and Middleton. The path set out appears to fit the witness testimony remarkably well. There is just one problem: the path is shown to be physically impossible due to the very high wing loading required to make the turn. Witnesses say the plane was “spooling up”, “full throttle” and “in a powered descent.” The sound was described as “absolutely deafening”. 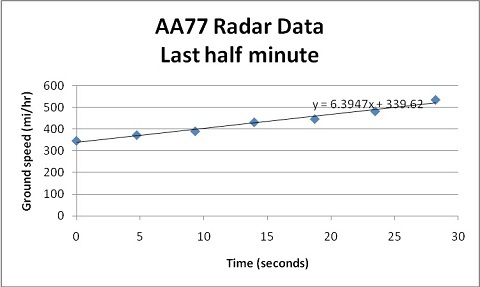 These remarks indicate that the plane was travelling fast and speeding up, as shown by radar (Fig. 8) and the FDR file, where we not only find the speed, 480 knots (552 mph) average for the last 4 seconds, but also see that the throttles were pushed fully forward for the last 30 seconds. A plane which has been traveling at a normal cruise speed, and then is diving at full throttle, must be accelerating and soon will be moving very fast. There is therefore no justification for claims that the turn might be possible because the plane was flying at some lower speed. If the speed is assumed to be only 300 knots (345 mph), the bank angle is still 79 degrees and quite out of the range of possibility. If the bank was 30 degrees, the highest value suggested by any witness, and then only very briefly (see Prather), the speed would be 102 knots, (117 mph). This is below the stalling speed for the plane in take-off configuration, hence quite impossible clean, with flaps and slats retracted. Figure 8: Spacing of radar position reports enables calculation of speed and acceleration. It is now apparent that the testimony of Stafford and Prather contains self-contradictory information. On the one hand they say the plane passed over the Naval Annex and some distance beyond, flying wings level, and on the other hand they say it passed north of the Citgo service station on its way to the impact region on the Pentagon. These concepts cannot both be right. It appears they misjudged the position of the plane and did not realize that it was south of the Naval Annex. This is not surprising, as they were poorly placed to judge the distance, being near the cemetery, but the angle of bank near the Annex would have been very obvious and easy to correctly assess. As they described in detail watching the plane descend, it is inconceivable that they could have missed seeing the plane perform the required steep right bank. What they are describing is a track in which the plane is mostly wings level, then briefly banks slightly to the right, and hence must deviate little. The FDR file shows a very brief bank of 6 degrees to the right, which produces no noticeable change of direction. 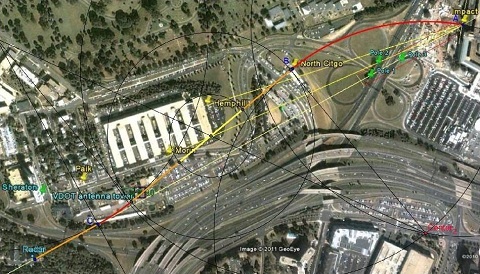 If the claim that the plane passed north of the Citgo service station is abandoned, assessment of all the other evidence leads comfortably to the conclusion that the plane passed to the south of the Naval Annex and the service station, flying close to wings level, and hit the Pentagon. Albert Hemphill, at his window in the Naval Annex, was the witness to impact who was in the best position to see the alignment and straightness of the track. He was asked if the plane was turning or banking. He replied, “Diving … right over the bridge.” There is only one bridge in the vicinity, the overpass of VA27 over Columbia Pike, which is on the direct line between the last radar position and the impact point. 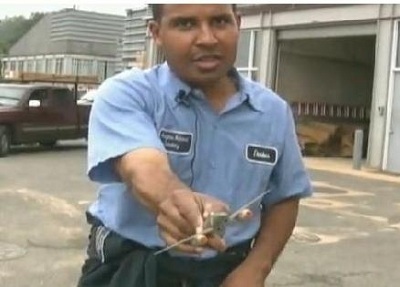 He asserted that the plane was always on his right and that “It didn’t pull up, it didn’t turn right, it didn’t turn left, it went right into the Pentagon”. When asked about the prior path of the plane he said it “seemed to come directly over the annex, as if it had been following Columbia Pike”. When asked whether the track could have been as far south as the VDOT antenna tower, he said “That would be a little bit far.” He also mentioned “ground effect,” implying that he saw the plane descend very low and with wings level. He made no mention of significant bank. After obtaining a Diploma of Agriculture (Longerenong, Victoria), Frank Legge spent his early years as an agricultural employee, then a contractor, in Queensland. He then obtained a “conditional purchase” block of virgin bush in Western Australia which he cleared and developed as a sheep and grain farm. On completion of this, he moved to Perth and enrolled at the University of Western Australia. After graduating with a Ph. D. in chemistry, 1983, he worked as a research officer for the Department of Agriculture for a number of years. This included research into the manufacture and use of biodiesel. He was also involved with the Australian Merino Society in development of their sheep breeding index. He and colleague then formed a company, Solar Track Pty Ltd, and embarked on a project manufacturing solar tracking devices, based on a patented concept they developed in conjunction with the Department of Agriculture. Lastly he moved to consulting. His understanding of the events of 9/11 are set out in his website: http://www.scienceof911.com.au/. This includes links to the papers he has written and co-authored. In short, the evidence for explosives in controlled demolition of all three buildings is both compelling and obvious, hence the failure of NIST and the 9/11 Commission to consider this possibility is prima facie evidence of corruption.